Do you want to get acquainted with the pre-Christian and Christian Armenia? Then take a tour to one of the most visited touristic destinations – Garni Geghard. In Garni you will find the most prominent and the only remaining monuments of Hellenistic Pre-Christian Armenia while in Geghard you will see the monastery which is considered to be one of the country’s greatest spiritual and cultural centers. 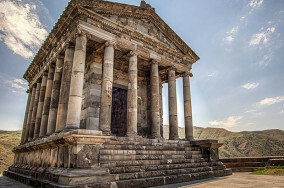 Garni is a pagan temple dedicated to the goodness of the Sun Mythra that was built in conformity with the canons of classical Greek architecture and is very similar to the well-known Temple of Athena in Greece. The Monastery of Geghard, with its remarkable rock-cut churches and tombs, is a complete example of medieval Armenian monastic architecture and decorative art. The present name Geghard means Monastery of the Spear, which originates from the spear that pierced Jesus Christ at the crucifixion. The spear was brought to Armenia by Apostle Thaddeus and long housed at Geghard. The Holy relic is now kept in the Treasury of the Mother Cathedral of Holy Edjmiatsin. Both places are set into a landscape of great natural beauty, surrounded by towering cliffs, rocks and forests. Don’t miss the chance to see the beauties included in World Heritage Sites of UNESCO!